Lottogo is an online lottery service. The service is legit as it is owned by Annexio Limited who are licensed and regulated by the Isle of Man Gambling Supervision Commission and UK Gambling Commission for UK customers. Their license was issued under the Online Gambling Regulation Act 2001 on 14th October 2011. Annexio Limited also own and operate a number of other popular lottery websites. The company guarantees that 100% of your winnings are passed on to you. Beat the Price Rise! 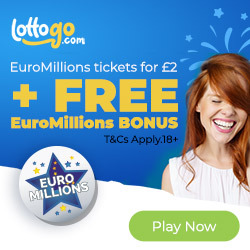 Buy 1 EuroMillions ticket for £2 plus free 55 chances bonus at Lottogo. By clicking on our special link you will find an exclusive Lotto Go promotion. There is no code required. 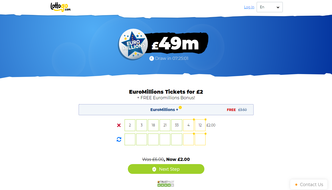 Buy 1 EuroMillions ticket for £2 plus get 55 bonus chances for free. So instead of paying £2.50 for 1 line in the shops, you will only pay £2 each but also get the bonus chances on top. The 55 bonus chances are played through their EuroMillions syndicate game and are worth £3.50 alone. 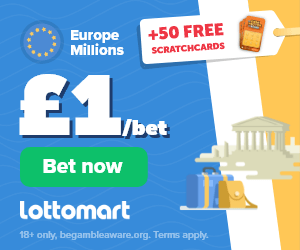 Your bets will be on the next EuroMillions draws, (Tuesday or Friday) Please note that you DO NOT need to take out a subscription to get this offer. Lottogo like many other online lottery agents is an online lottery betting service. When you make a purchase you are ‘betting’ on the outcome of a lottery. This is the same as buying the ticket itself as you still win the same prizes should your numbers be drawn. The only reason for this is so you are not restricted based on your country of residence on which lotteries you can play. You can play single line lottery bets or syndicate bets for more chances to win. You can also choose 1 draw or subscribe to multiple. If you choose to subscribe for 52 draws you will get up to 7.5% discount. After making a purchase you will receive a confirmation email. You will be able to login to your account at any time to view your active lines and any winnings. If you do take out a subscription you can see in your account when you will next be charged. When you win your money is credited straight into your account where it can be withdrawn or used for future purchases. As well as single entry lottery bets you also have the option to buy syndicate bets on this site. There are currently 9 different syndicates available playing some of the world’s biggest and highest paying lotteries. Some of these lotteries include the EuroMillions, the EuroJackpot, the USA Powerball, the Oz Lotto and lots more. The price to join a syndicate is not much more than buying a single entry bet but gives you considerably more chances to win. For example in the EuroMillions club, you pay £3.50 to get your place. This gives you 55 entries per draw. (55 chances to win) If your syndicate wins a prize then you win 1/150th of the winnings. 100% of the winnings are sent straight to your account without any deductions. When you win your winnings will automatically be added to your online account. If you win any amount over £1 you can withdraw using the same methods that you used to deposit. There may be other withdrawal methods which can be found by logging into your account. You can also use your winnings for any future single entry or syndicate tickets through the website. Your lottery numbers will be available to view in your account. If you cannot login you will need to contact World Lottery Club’s support using the details above.